Four bedrooms. Sleeps 8. Pets welcome. Garden. Open fires. Free fast wi-fi. Appledore Cottage is a lovely end of terrace cottage with a large garden, plenty of parking and glorious views over the surrounding hills. The cottage is very comfortable, well maintained and very well equipped (including, despite its rural location free high speed Wi-Fi internet). Appledore is light and airy by day and cosy in the evenings. There is a large, slate floored, kitchen living room with sofas, free-sat television and a wood burning stove at one end with fitted oak units at the other and a circular dining table, dishwasher, oven, fridge and freezer and washing machine. Also on the ground floor is a very cosy sitting room with open fire, a downstairs twin bedroom and a shower room with a good powerful shower. The downstairs has underfloor heating. There is easy access to the large garden and a lovely sheltered patio for al fresco dining. Upstairs there are two double bedrooms and one twin bedded room. All the beds are of a very high quality and the bathroom has a lovely large bath. The cottage has fast free internet Wi-Fi. Appledore Cottage is set in the small hamlet of Thorgill. It is at the end of a no through road which makes it very peaceful but not isolated. The cottage has lovely views of the surrounding hills and countryside and has a large garden with plenty of space for sitting out or playing. There are wonderful walks from the house of varying distance and challenge and relaxing in the garden on a summer's day is an absolute joy with the babbling stream to be heard over the adjacent field. There are maps in the cottage which you are welcome to use and we provide plenty of local tourist information. Rosedale is a wonderful valley in which to walk and for those who want to walk further Farndale, Hutton le Hole and Lastingham and all within reach on foot. The nearby village of Rosedale Abbey has two pubs, which both serve meals, and two small shops both with tea rooms. Both shops have basic provisions and one sells newspapers and has internet access. There is a lovely walk from the cottage to the village. There is also a small golf course at the end of the lane and there is horse riding available locally. There is good shopping at the local market towns of Kirkbymoorside and Pickering which both have a weekly market. There is a swimming pool and leisure centres at Pickering. One of the leisure centres has tennis courts. There are plenty of good food serving pubs and restaurants nearby. Whitby, Scarborough and the North Yorkshire coast are within easy reach as are York, Castle Howard, Flamingoland theme park and zoo, the North York Moors Steam Railway, Goathland and Heartbeat country and the Danby Moors Centre. The Yorkshire Moors National Park is full of lovely villages with great pubs, fantastic walks, wonderful streams and a host of idyllic spots to relax and unwind. We have lived in the North East of England for the last 23 years. Having lived for many years in Durham we currently live in Washington which is just south of Newcastle. David is the Rector of Holy Trinity Church in Washington and Emma is a partner in a North East firm of Chartered Accountants. We have three children who are all now young adults. We fell in love with Rosedale Abbey after having a couple of holidays there when our children were young. We thought then, and still do, that Rosedale has to be one of the most glorious places in the world! We began to look for a property to buy. We wanted somewhere which required renovating so that we could plan what we wanted. When we first saw Appledore is was in a pretty poor state but in a glorious position. It was exactly what we wanted. Having hired an architect and a brilliant local builder we set about completely renovating the cottage and significantly extending it. The work was completed in 2000 and, while retaining its charm, the cottage was completely modernised. If you stay in the cottage do look at the photo album which records the renovation process. We started to let Appledore as a holiday cottage in 2005 and have enoyed seeing many families holidaying there and enjoying the cottage and the beautiful countryside. We continue to enjoy the cottage still and stay there several times each year. It was the glorious location that made us fall in love with Appledore. The garden feels like a continuation of the hillside and we just love it. It feels like our piece of heaven and we so love being there. toilet, shower, Downstairs there is a powerful shower room and a toilet. toilet, tub, Upstairs there is a large bath and toilet. The bathroom upstairs has a large bath with taps in the middle and is wonderful for a luxurious soak alone or with company! The downstairs marble tiled shower room has a good powerful shower. Appledore Cottage has free wi-fi broadband internet. We do not provide a computer. Bath towels are provided but not beach towels. Appledore has a wood-burning stove in the kitchen and an open fire in the sitting room. Logs are provided. The cottage has a kitchen/living room and a seperate sitting room. Both rooms have televisions. There is bluetooth speaker in the kitchen. Wi-fi Internet access is available. The kitchen television uses Freesat. There is a small golf course very near the cottage. The cottage is very well equipped. There is garden furniture for relaxing and for al fresco dining. Although we welcome toddlers parents should be aware that in part of the garden there is a retaining wall with a 1m unprotected drop although there is plenty of other space to play. Thank you for your lovely review. I am so glad you enjoyed your stay and appreciated the cottage and the glorious countryside so much. 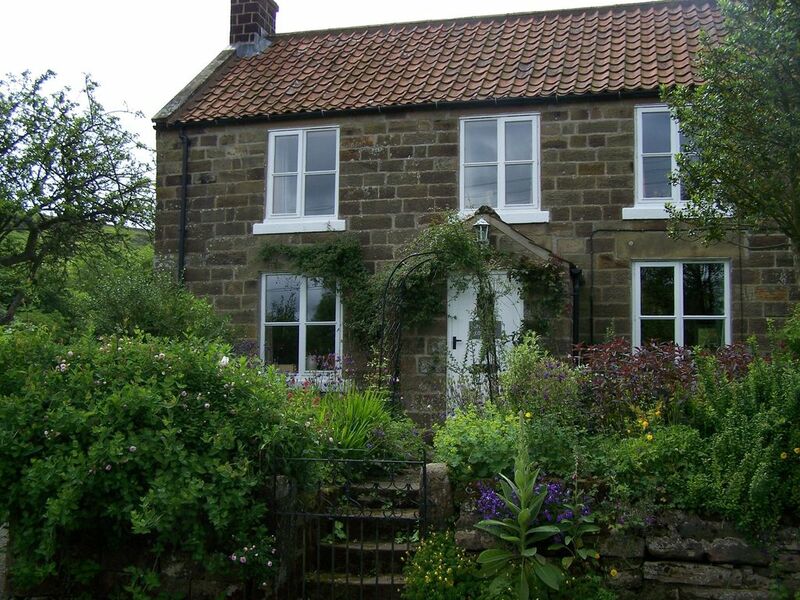 Appledore Cottage is set in glorious Rosedale at the heart of the North Yorkshire Moors National Park. Rosedale has wonderful scenery and there is great walking from the house. The cottage is located in peaceful and delightful countryside and yet Whitby, Scarborough and the North Yorkshire coast, York, Castle Howard, the North York Moors Steam Railway, Goathland, Flamingoland and lots of lovely villages and streams are within easy reach. Rosedale Abbey is within easy walking distance with pubs and tea shops. There is a small golf course just along the lane and plenty of local horse riding. This is a truly wonderful part of the world.